These are some of my views. 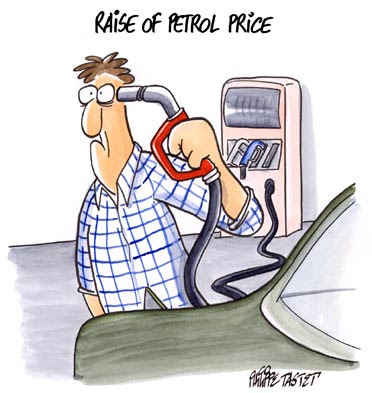 With oil prices set to rise by 5 Rupees per litre from today we are in for another round of passionate hand-wringing and cries of exasperation from the general public. The signs are already there. The fireworks will promptly ensue. Political parties from across every perceivable political divide will join their hands in protesting this grotesque injustice. "How will the poorer sections survive? How will the middle-class fare? " will be their moot-points. The Left will stage street protests in Delhi lead by the likes of Mr & Mrs Karat in tow with the Boses and Bhattacharjees from Bengal. A single LPG cylinder costing 20 Rupees more will make them froth at their mouths with righteous anger and hurt at having had to support such a worthless government at the Centre for so long. But then, what could they have done otherwise. Support the 'communal forces' to form a Govt. ? Never! The moderates will dub it as the proverbial 'unfortunate' and 'anti-poor' policy. The Congress will be quaking at their knees. With 12 consecutive defeats in State elections the nation over it is in a political coma, in serious need of a quick resuscitation it hopes it will find in Rajasthan( Gujjar uprising) and Madhya Pradesh ( anti-incumbency) in the coming elections. A vehement opposition at this crucial juncture, less than a year away from the General Elections, which might decisively turn the tide against them is singularly terrifying a proposition. And that has considerably cushioned the rod for the aam aadmi this time around. Otherwise a 10 Rupee hike per litre of petrol and a 50 rupees more for a LPG cylinder would have been the biting reality tomorrow morning. With the nationalized Oil Corporations running into huge losses by accommodating for heavy subsidies this hike had become inevitable for some time. Crisis, be it food or oil, has become a global phenomena. Nothing can insulate the Indian masses from its effects and its better if we realize this reality fast and brace ourselves for some tough times ahead.The remedy to this global malaise is in planning ahead. The much touted vision of 'Energy Security' seems to have taken a permanent backseat with the Left having effectively steamrolled the Indo-US Nuclear Deal for the sake of hanging onto its logic defying 'Anti-America' stand. The Iran-Pakistan-India Oil pipeline also seems mired in diplomatic tangles with the pendulous nature of Indo-Pak relations. If our political visionaries ( now don't you start counting, you may not even end up with one) do not show resolve in tackling the situation and make a strategy for the future India's juggernaut might come to a most inglorious halt. And all in want of oil. Sample this. China has already secured oil-mining rights throughout Africa, leaving hardly any profitable pocket for India to nudge, push or fit in. The race for oil is but over in Africa and its all China written across that continent. That leaves India to explore its possibilities in the Sakhalin belt and other Central Asian countries, which given its snailish pace of proceedings might never be substantiated. By all means, the energy situation for India seems grim in the future as oil-starvation will effectively peg back its growth rate to the pre-1990 4% figure, rendering the manufacturing industry vulnerable and infirm. So, assessing the situation in the light of the impending global crisis this hike is but a mild tremor. The real shocks might follow soon. Until then, all hail Subhash Chakrabarty and hope that our bus fares don't go through the roof. The Rajasthan Royals have clinched it and Kolkata is witnessing stray fireworks in its skies as I write this. I am sure the same would have been the case if the Chennai Super Kings would have won. Strange strange city, this. Tomorrow will be a day of jubilation, adulation and accolades for the Champions. They have played excellent cricket throughout the championship and gelled well into a team. Starting off as the clear-cut underdogs they have proved their mettle and how. The day after will see ( if my ability at estimates haven't marooned me of late) articles applauding the mega success of the Indian Premier League and the people behind it ( read Lalit Modi and Co.). The following days will revolve around speculations from various quarters as to how the game of cricket is being commercialized in the most revolting manner in its 20 over installment which reeks of publicity-hunger and easy cash. I too will join in as I have hardly written anything on ( and believe it or not, seen) IPL. boy 2 :( visibly confused) Why ? The Royals deserve it. They were the underdogs. Right ? And look at Warne. How he has captained the side. Great! Just Great! No foreign captain should walk away with our trophy. Its called the Indian Premier League, dammit! Why can't these *expletive* Aussies stay put with their World Cups. Greedy Bastards! Are You Kidding Me !!??!!? ?